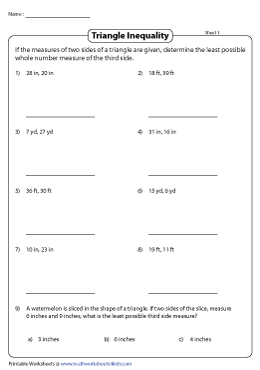 Focusing on the triangle inequality theorem, the high-school worksheets feature adequate skills such as check if the side measures form a triangle or not, find the range of possible measures of the third side, the lowest and greatest possible whole number measures of the third side and much more. Solve a word format problem in each worksheet and instantly review skills with the multiple response PDFs. Do the side measures form a triangle? Figure out if the given lengths form the sides of the triangle by applying the triangle inequality theorem. Add any two lengths, if their sum is greater than the third side, then the sides form a triangle. 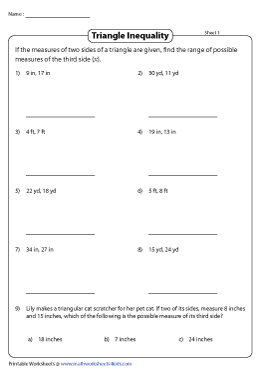 Compute the range of possible measures of the third side of the triangle in this set of worksheets. The difference between the two sides makes the lower range, while the sum of the two sides forms the upper range. Subtract the two given side measures and add 1 to the difference to determine the least possible whole number measure of the third side. 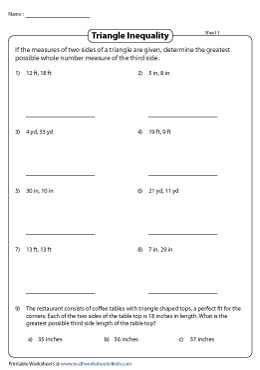 Reaffirm the triangle inequality theorem with this worksheet pack. The length of a side of a triangle is less than the sum of the lengths of the other two sides. Add up the two given sides and subtract 1 from the sum to find the greatest possible measure of the third side. Reiterate the triangle inequality theorem with multiple response questions. Determine the least and greatest possible measures of the third side and also check if the given measures form a triangle or not.